Two of the most interesting cards from Primal Clash are Maxie’s Hidden Ball Trick and Archie’s Ace in the Hole. These are a pair of Supporter cards that allow you to play a Pokemon of specific types from your discard pile straight onto your bench. The first major use of one of these cards was the use of Archie’s Ace in the Hole in multiple Flareon and Night March decks that made Top 32 at Florida Regional Championship to put Empoleon DEX into play. What makes these cards so exciting is that they appear to give easier means for getting Stage 2 Pokemon into play and being able to get a Stage 2 Pokemon into play without clogging up your deck with thick evolution lines and Rare Candy. Something to note when playing these cards, even though the Stage 2 Pokemon doesn’t evolve into the Stage 2 and comes straight to the discard, for game purposes, it is still a Stage 2 Pokemon, just an unevolved one. Therefore, a card such as Silent Lab wouldn’t affect a Stage 2 Pokemon with an Ability on it from working. In this article, I will go over how to put yourself into a position to actually use these cards, and then go over the various Pokemon that we could look at using with these cards to get and the strategies they could fit in. To successfully play one of these cards there are two criterion that we need to fulfill. First, we need to manage to get a Pokemon into the discard pile that can act as a valid target for this card. Second, we need to play our hand down to nothing but Archie’s or Maxie’s. The best means for getting a Pokemon in the discard pile is to use Battle Compressor, which lets you search your deck for up to three cards and then put them into your discard pile. 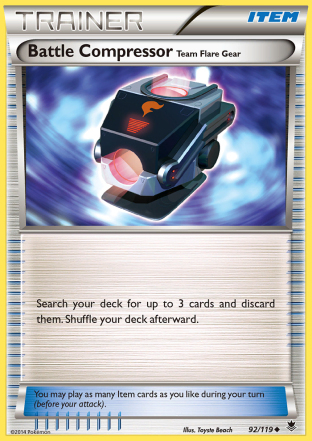 Battle Compressor is especially great, as it not only can put a Pokemon to target in the discard, but it can also put Archie’s or Maxie’s into the discard pile for you to put into your hand with a VS Seeker if you don’t currently have the Supporter in hand. Not surprisingly, both of the decks that first used Archie’s are decks that play four Battle Compressor. Other means for getting a Pokemon into the discard pile are cards like Ultra Ball and Computer Search, which can be used to discard the Pokemon if it is in your hand. The second part of the equation is to play your hand down to nothing but the Supporter. There isn’t a whole lot that I can do to really explain how you do that. The main thing you want to have are cards that can discard other cards from your hand (Ultra Ball/Computer Search), as well as burn cards that you can play that don’t necessarily put a replacement card in hand (cards like Battle Compressor, Town Map, or Professor’s Letter). Playing your hand down to just the Supporter is kind of like solving a puzzle. The more you practice it, the better you will get at solving it correctly. My best recommendation would be to just play out a bunch of hands with decks that play these cards to get used to figuring out the different ways that you can play your hand down to one. One thing that really does help with properly manipulating your hand size is having cards that can adjust your hand size. Cards like Slurpuff PHF and Exeggcute PLF can be used to manipulate your hand size so that you have the right amount of cards in your hand for discards with cards like Ultra Ball. 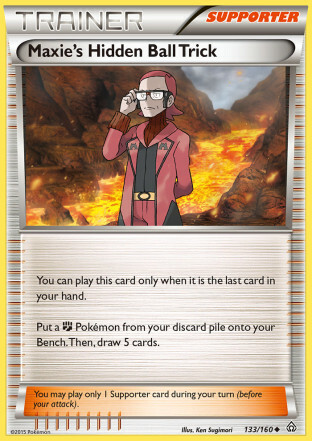 Maxie’s Hidden Ball Trick lets you put Fighting Pokemon from your discard pile onto your bench. The Fighting deck Landorus EX/Crobat PHF is currently Tier 1 and Landorus EX/Hawlucha FFI also made Top 32 in Florida, so it’s possible that there might be Fighting type Pokemon that could go in these decks to advance their strategy. Additionally, Manectric EX, M Manectric EX, and Darkrai EX all play important roles in the meta game, so there might be some Fighting Pokemon that we can look at as playing as techs against those decks by using Maxie’s. 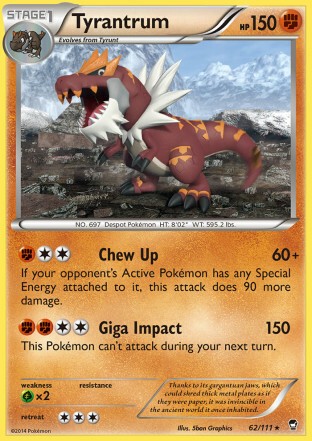 Tyrantrum FFI – This is a card one wouldn’t immediately think of, but it is worth considering as a tech option for Fighting decks as it has a high HP of 150, and can do a lot of damage against anything with Special Energy attached with its Chew Up attack which costs [F][C][C] and does 60 damage, plus 90 more damage if your opponent’s Active Pokemon has any Special Energy attached. The reason you would play Maxie’s to get this out is because Tyrantrum has to evolve from Tyrunt, which is a restored Pokemon. Setting up a deck to use the Fossil Engine or to play Fossil Researcher effectively can be space intensive as well as inconsistent. 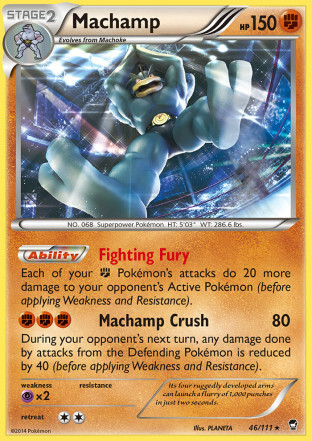 Machamp FFI – This is probably the most obvious pairing for Maxie’s, as people have already been trying out Machamp in Fighting decks. The Korrina engine is pretty consistent for getting out Stage 2’s as it can get you both the Stage 2 and the Rare Candy. However, playing Stage 2 lines with Rare Candy takes up a lot of space. 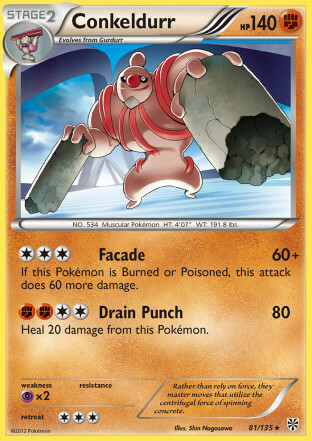 Where I envision Machamp being combined with Maxie’s is as a two count in a very Trainer heavy Fighting deck. Think something simple, such as a Landorus EX/Hawlucha FFI deck that plays a lot of disruption cards such as Head Ringer and Enhanced Hammer, which just plays two Machamp and a Maxie’s to possibly get a damage boost at some point in the game. 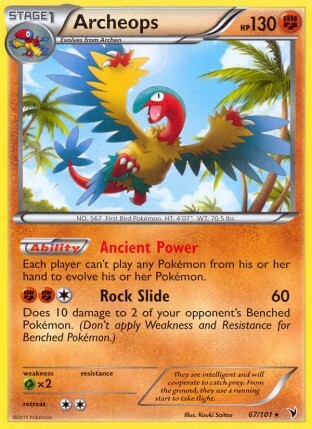 Conkeldurr PLS – This isn’t a card that has much purpose in competitive play, but it could be a very neat tech to get with Maxie’s in any deck that is weak to Lightning Pokemon, such as Yveltal EX, that needs a counter to help swing that matchup. Conkeldurr would be used for its first attack, Facade, which costs [C][C][C] and does 60 damage base, as well as 60 more damage if it is burned or poisoned. It isn’t the greatest counter, but with a Muscle Band and Hypnotoxic Laser it can OHKO a Manectric EX. Primal Groudon EX – This isn’t how you really want to play Primal Groudon EX as the basis of a deck. Using Korinna to fetch both the Groudon EX and its Spirit Link has proven in testing to be a much more effective way to play the card, as you don’t really gain anything from getting Primal Groudon EX into play a turn earlier. However, if you are already using Maxie’s to get something like Machamp FFI, you could put one Primal Groudon EX into the deck as well to have it as an option, while not using three deck spots on it. Archeops NVI – This is just an option for Expanded, but it’s a very impactful tech in the Expanded format. Archeops has the Ancient Power Ability, which says each player can’t play any Pokemon from their hand to evolve his or her Pokemon. This can be worked around by Evosoda, but few decks are playing that card, and it is less consistent than just playing a ball engine. For example, the Flareon deck that won Florida Regional Championships is entirely reliant on its evolution. If someone were to use Maxie’s on turn 1 to get Archeops, the Flareon player would then be unable to evolve into any Flareon until the Archeops was knocked out, and the player would have to rely on cards like Empoleon DEX or Audino BCR to do it, if they can even do it. By the time the Flareon player were to knock out the Archeops, they may be too far behind to forge a comeback. This would obviously be a tech for Big Basic decks, such as Yveltal EX. That’s really about all there is that you would really want to play Maxie’s Hidden Ball Trick for. Unfortunately, we don’t have a very deep card pool of Stage 2 Fighting Pokemon with interesting Abilities or attacks to use with the card. 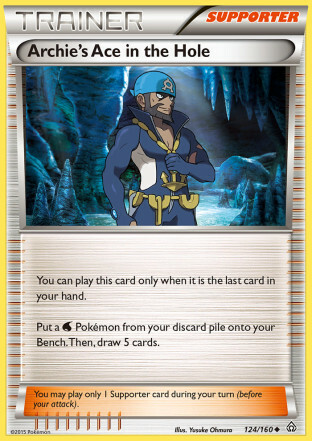 Archie’s Ace in the Hole was the first of these two cards to find a place in the meta game, getting played in both Flareon and Night March to put Empoleon DEX into play. Empoleon aided both of these decks by giving them a boost in draw power, another option to put Pokemon into the discard pile, as well as a hard counter to Landorus EX, which could be difficult for these decks to deal with when part of the Landorus EX/Crobat PHF deck. 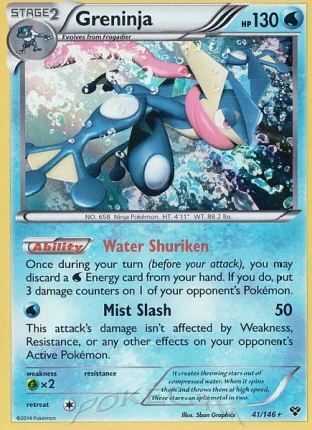 We already know how Empoleon works with the card, but what other Water Pokemon should be on our radar? 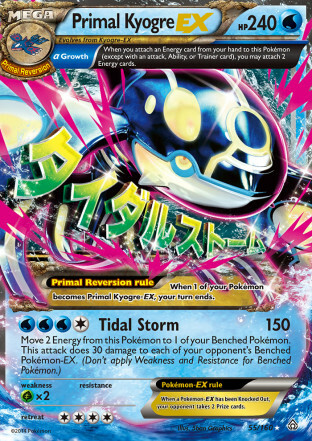 Primal Kyogre EX – What was said about Primal Groudon EX applies here, if you’re playing a Water deck and already playing Archie’s, you may consider putting in one of these just to keep it as an option. 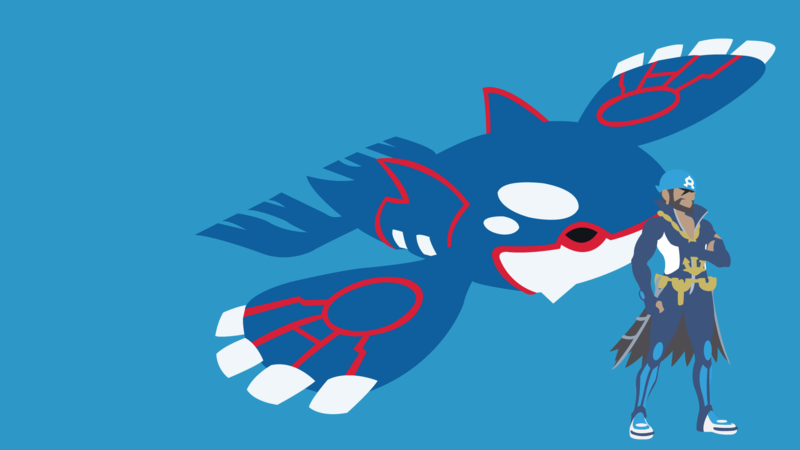 However, Archie’s is more impactful when played with Primal Kyogre EX than Maxie’s is when played with Primal Groudon EX. The reason for this is Primal Kyogre’s Growth Ancient Trait. If you were to get a Primal Kyogre EX in play on turn 1 with Archie’s, you could attach two Energy to it on turn 1, and then two more Energy to it on turn 2 and then be able to attack with it. If you were to evolve a Primal Kyogre EX normally, the earliest you would be able to attack with it through attachments would be turn 3, so by playing Archie’s, you could potentially speed up a Primal Kyogre deck by a turn. 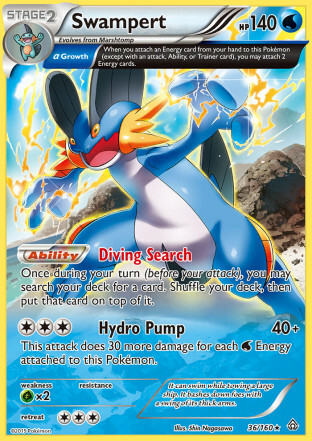 Swampert PCL – This is one of my favorite cards from Primal Clash, primarily because of its Diving Search Ability, which lets you search your deck for any card and put it on top of your deck. This card works very well with Slurpuff PHF (as well as other draw cards like Professor Juniper, Bicycle, Acro Bike, etc.) but I especially like it with Slurpuff, as you can consistently get whatever card it is you want that same turn, even if you don’t have one of those other draw cards in hand. Being able to choose any one card that you want to have in your hand is very powerful and allows you to consistently execute your strategy. I would be shocked if this combo never shows up in a deck that does well at a major tournament. If you play Swampert, you can even use it as a tech attacker to hit Water weak stuff, especially if you already play with Double Colorless. It has the Growth Ancient Trait, so its Hydro Pump attack can be setup in one turn. If one of the Energy you attach is a Water, and you have a Muscle Band attached to it, you can hit the magic number of 180. 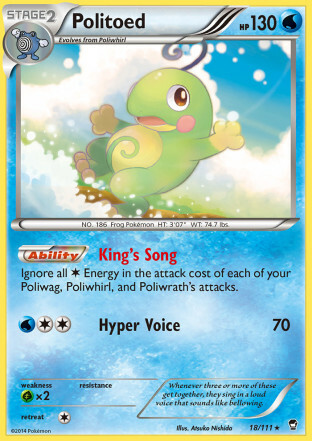 Politoed FFI – One of the key flaws of the Poliwrath/Politoed archetype that came out of Furious Fists was that you were unable to play a full Poliwrath line effectively, as you would have to evolve at least one of the Poli-lines into a Politoed. Politoed removes the Colorless attack costs for your Poliwag, Poliwhirl, and Poliwrath, so it’s very important to get into play for the deck as it lets them use some of their attacks for free. With Archie’s, you could just focus on using your evolution lines to evolve into Poliwrath, and get your Politoed into play with Archie’s. Aurorus FFI – This is another Pokemon that evolves from a Restored Pokemon, so you would use Archie’s like you do Maxie’s for Tyrantum to avoid using the convoluted Fossil mechanic. Aurorus has an Ability, Ice Shield, that reduces damage done to your Water Pokemon with Water Energy attached by 20 damage. Greninja XY – Greninja’s Water Shuriken Ability lets you discard a Water Energy to do 30 damage to one of your opponent’s Pokemon. This simply would fit in anything that can play Water Energy to add to your damage output. You probably would only want to play this in something that plays a high count of Water Energy, as something like Seismitoad EX with disruption, which generally just plays 2-3 Water Energy, wouldn’t get great use out of this card. One combination could be in a M Manectric EX/Water deck, as you want Water Energy in the discard pile to get back with Turbo Bolt anyhow. Where this card may fit in very well is with Primal Kyogre EX. Primal Kyogre EX does 150 damage, which is an awkward number, as it is just short of a KO. By adding Water Shuriken into the mix, Primal Kyogre EX decks could get up to that magical 180 damage output in one turn. Blastoise BCR – This card is obviously very strong, it was part of a Tier 1 archetype for over a year. Unlimited Energy attachments is one of the strongest Abilities in the game and makes many cards that would be otherwise unplayable because of Energy costs playable. The most obvious use of this card would be to reinvent the Blastoise archetype, using Archie’s to get Blastoise into play instead of evolving with Rare Candy. I wrote about this type of deck already and you can check out the article here. 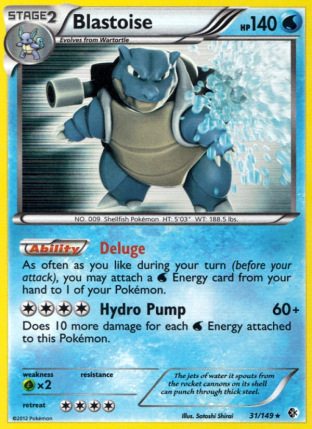 A more interesting use of Blastoise could be as a tech in other Water decks. It could be used in a Primal Kyogre EX deck. This deck can setup fine and attack throughout a game wholly without Blastoise, but getting a Blastoise into play would open up the deck to attacking with any of your Pokemon at any time, even if they weren’t previously setup with Tidal Storm. Similarly, a M Manectric EX/Black Kyurem EX deck could use a tech Blastoise to power up Black Ballista without needing to use Turbo Bolt to get Energy on a Black Kyurem EX. I absolutely love these two cards, and am very excited to see what combination players pull off during these cards lifespans. I think they will see most of their play just to grab a single target Pokemon, but I think at some point there will be decks that use these cards to target multiple cards. In particular, I really want to experiment more with a Primal Kyogre EX deck that uses Archie’s. I think getting either Greninja XY or Blastoise BCR onto the field could be very impactful for the deck, and it even could be used to put a Primal Kyogre EX into play. The cards are great, and should continue to be great for their entire lifespan as there should never be a format that includes these cards that doesn’t also include VS Seeker and Battle Compressor. Every new set that comes out, it will be important to look over every Water and Fighting type Pokemon to check if there are any new combinations to use these cards with. Featured image credits to Dashing Hero. Check out more of their stuff on Deviant Art.